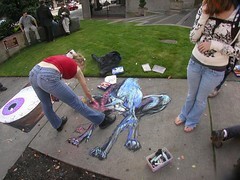 Q: Are the Frost Park chalk offs over???/? A: No. But the remaining episodes are numbered. See below. No doubt you will have friends and acquaintances who are in the contest. Do your best to be as objective as you can in your analysis of the chalk submissions which will strengthen the participatory voting system in place.Frost Park Challengers are encouraged to vote as well for an additional perspective to the event.Each person gets one vote. Votes will be accepted until midnight on Friday after which the winner will be declared. Votes will be accepted starting at 1:00 p.m.
by KevinFreitas on 10/17/2008 @ 8:35am I'm definitely there! 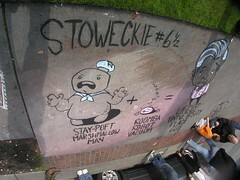 I hear Stowe might be doing a Stoweckie live with audience participation to boot! See y'all at lunch! by Mark Monlux on 10/17/2008 @ 9:28am Will do my best to be there. Not square. Currently, I have no idea of what I'm going to be doing. Now I have an idea. by Erik on 10/17/2008 @ 11:55am The weather looks to be very good today. What luck! in an age in which the worldwide image of the United States is at an all time low, it is interesting to confront these critical images from an earlier time, now emptied of any serious, practical challenge. Chalk Challenge No. 28 is made possible through charitable donation by HOLISITC FORGE WORKS' MINISTRY OF PRIZES! FIRST PLACE PRIZE includes A COMPLETE SET OF DANGER GIRL COMICS #1 - #8! (courtesy of Tacoma's own COMIC BOOK INK). SECOND PLACE PRIZE includes underground cult graphic-novel LOVE AND ROCKETS NO. 15 SATYRICON* (courtesy of FANTAGRAPHICS, Seattle) ! Now for the voting... Decision time. by Dave_L on 10/17/2008 @ 1:55pm What fantastic pieces of art! I wish I could have stuck around to watch. I did want to jump in and post a thank-you to RR for the cool book of vintage Superman comics. It was a most excellent prize. by Erik on 10/17/2008 @ 2:00pm Nice pieces today. Adam had a fun piece and Stowe is forging away on in the zany genre. However, its between Andrea's werewolf and Mark's eye this week for me, two top notch pieces. by tacomachickadee on 10/17/2008 @ 2:15pm I vote Mark. by Mark Monlux on 10/17/2008 @ 2:35pm Eye really want those Danger Girl Comics! I still vote for Mark. Wait... wrong day and wrong venue. Let me see... who is the most Obamaish Chalkie out there today. Who is the new hope of Frost Park. Well that's simple... its my son. I vote for Barrett (cause he asked me too). If that doesn't count. I vote for Monlux's Eyeball. So it will stop staring at me. So to clarify... I am voting for Barack Hussein Obama, the youth of today and a creepy eyeball. by Adam the Alien on 10/17/2008 @ 3:44pm Though I remain ever-envious of Andrea's style, I can't resist a good, detailed eyeball. Mark's got my vote this week. by Dave_L on 10/17/2008 @ 4:21pm Isnâ€™t this the penultimate episode of this chalking season? Itâ€™s great to still have newcomers enjoying the event, including Newcomer #1 who responded to the listserv notice and showed up early. I know Andrea was fretting about not knowing the prize theme this week so she could tailor her subject, but thatâ€™s a spectacular Reluctant Werewolf! 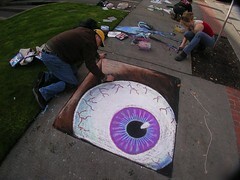 Chalkers are really breaking into and using the third dimension and Monluxâ€™s eyeball is also vying for my vote. I canâ€™t decide between the two, so let me toss a coin. by Mandiferous on 10/17/2008 @ 4:52pm I vote for Mark's Urban Eye. 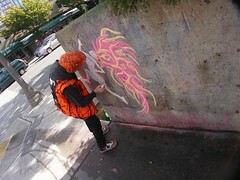 by izenmania on 10/17/2008 @ 4:55pm Isnâ€™t this the penultimate episode of this chalking season? No sir. Penpenultimate! The last one is Halloween, which is in two weeks. by droid116 on 10/17/2008 @ 5:04pm Love the werewolf to be sure. However, that eyeball just jumps right at you. Not since Marty Feldman has an eye jumped like that. And I love them jumpin' eyeballs. by AngelaJossy on 10/17/2008 @ 5:09pm I love that we are starting to delve into the next dimension with 3D pieces! That eyeball was rockin! And I really liked Ian's running redhead but damn that werewolf was too awesome! Reluctant or not, it gets my vote! by jcbetty on 10/17/2008 @ 5:28pm I gots ta go with the eye, myself, though the werewolf was amazing and I really really dug on the Stowe equation. by Mark Monlux on 10/17/2008 @ 5:56pm I also promise Barrett that I would vote for him. But, exposure to Danger Girl Comics at such an early age with all their exposure might be, well, Dangerous. So, to make sure this doesn't happen, the rest of you should all vote for me and make sure that those comics get safely placed into...uh...adult, yeah, that's it, adult hands. by JessicaJossy on 10/17/2008 @ 6:05pm i vote for the eye. thats amazing. by jacksonscott on 10/17/2008 @ 6:28pm The reluctant werewolf has my vote, the shading/lighting is way cool! Mark's eyeball was a VERY close second. by ElectricElliot on 10/17/2008 @ 6:34pm I vote for the Werewolf. by ALT on 10/17/2008 @ 7:12pm Wow, there were a number of entries that photographed particularly well today; Mark's Tacoma Eye really "pops" in the photo. I like Ian's flamer haired gal - she kind of reminds me of The Hub's bicycle siren! Adam, I dig that Jekyll and Hyde Alien! This week however I'm going to go and vote for my own entry, The Reluctant Werewolf. I'm genuinely satisfied with the way he turned out, and he photographed particularly well. I chose blue because it's my favorite color, and it finds its way into most of my compositions. The addition of hot pink light prompted me to think I had seen this critter before; I realized this werewolf bears a striking resemblance to the blue and pink werewolf from the cg "Transformers" cartoon, Beast Machines - I cartoon I had gotten into during my college years. by NineInchNachos on 10/17/2008 @ 8:19pm Mark Monlux's Clockwerk Orange Eyeball is a very intimidating entry. It's fun to see Mark give in to the dark side... exploit the black powers of charcoal. Provides a jarring contrast with the glossy white eye. Andrea's reluctant Werewolf again proves her superior lighting skills she wins the "Master of Light" cup of the season i'm afraid. Adam the Alien explores the duality of alien people with his black-hat white-hat Gemini piece. 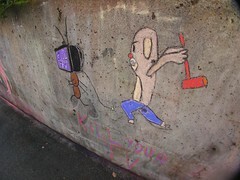 Electric Elliot's Bob the Dog web-comic character makes his first appearance at Frost Park. A welcome addition to be sure! I was listening to an interview with the great Harvey Kurtzman today. Kurtzman described how he got his start drawing cartoon strips with chalk on the sidewalks of New York... good times! I'm very happy to see the new people coming back for more chalk challenges! The red headed woman is playful and happy... obviously in celebration of our sunny Friday. unsure who to vote for just yet. by NineInchNachos on 10/17/2008 @ 8:22pm Also, Dave L. You earned your prize from episode 27. Your entry mixed with a weeks worth of rain created interesting effects on all the concrete surfaces! by tacomachickadee on 10/17/2008 @ 8:24pm I love that just one week after cursing the black ... Mark was using it with STYLE! by Erik on 10/17/2008 @ 8:25pm The eye breaking out of the sidewalk is awesome. The lighting on the wolf from the letters worked out well. Mark's eyeball was good and deserves a slew of votes. But not a sweep. I vote for the wolf. It's a stellar piece. by NineInchNachos on 10/17/2008 @ 8:26pm first place winner gets DANGER GIRL COMICS! from tacoma's own COMIC BOOK INK! by NineInchNachos on 10/17/2008 @ 8:30pm second place: LOVE AND ROCKETS underground comic for YOUNG ADULTS! by TacomaGnome on 10/17/2008 @ 8:42pm M-eye vote is for Mark. by NineInchNachos on 10/17/2008 @ 8:56pm 1 vote for the Eye! the eye!! by KevinFreitas on 10/17/2008 @ 9:25pm Fine job to everyone today! A special kudos for Ian in his second week and to promising newcomer #1. I had to choose between Ian's Hub like lady (darn my soft spot for redheads), Andrea's well lit creation, and the ever seeing eye of Monlux. For scale and sheer pop (along with other artful qualities) I gotta vote eye this week. by joel413 on 10/17/2008 @ 11:15pm So now I'm trying to figure out how to get in one more FPCC this season... I'll be on Jury duty the week of #30... so maybe I'll luck out and have to be there that day and can come down the hill for a brief bit o'chalkin! As far as #28 is concerned, I liked many of the entries. the eye doesn't need me, nor does my reluctance lead me towards Andrea. Both are worthy, but not going to pull me in this week. No. This week I am going to cast my vote for Adam and here's why. Notonly is the Gemini/Army of Darkness a fun theme, if you look at the way he drew his piece he incorporated the huge leaps that his talent has taken over the course of the season. His "Black Hat" alien has that bit of old adam style that was cool and fun but didn't have the pop and style that he now commands whereas "White Hat" alien has the shading and lighting that he's learned to incorporate. He uses the color black to make it POP as we are want to say. An absolutely perfect testement to FPCC and how anyone can come along and go from someone having fun drawing on the sidewalk to a bonafide artist. by izenmania on 10/18/2008 @ 8:17am My goodness, no one's tallied yet? by Mark Monlux on 10/18/2008 @ 10:21am I want to thank everyone for voting for me and my big ogling eye. Many thanks. by Erik on 10/18/2008 @ 1:37pm Congratulations Mark. Another win for you! by Mark Monlux on 10/18/2008 @ 6:09pm I took my wife out to dinner at the Pacific Grill last week. She had the filet mignon and it was the absolute best! The appetizers of fried chanterelles were also very interesting. I ate them all up. Great atmosphere too. I will go back even without a gift card. Can someone let me know if I can go straight to Comic Book Ink for the prize? They are just down the road from my place. by NineInchNachos on 10/18/2008 @ 7:05pm I have your prize comics Mark. Can deliver them next Friday? 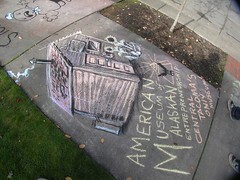 by Mark Monlux on 10/19/2008 @ 9:23am I will be in New Jersey next Friday, and will miss the next Chalk Off. by NineInchNachos on 10/19/2008 @ 12:50pm I'll hold them for you sir. Safe in there protective cellophane baggies.